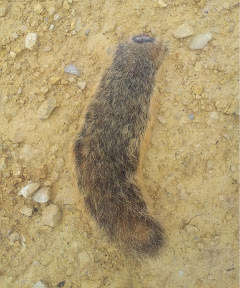 This is the tail from the squirrel that Owen shot. This is the tail that Uncle Mark skinned for Owen's collection. This is the tail that sat on Owen's dresser for 2 weeks. This is the tail that eluded Trevor & me for 2 days while we searched Owen's room for the source of the rotting animal smell. This is the tail that sat rotting in our house for 14 days because Uncle Mark did not take the time to actually skin it! This is the tail I plan to wrap up to give to stupid Uncle Mark for Christmas....moron.